This is another one of my rare mid century ceramics. I have owned this personally for decades now, but have decided to part with it as it has been packed away for "keeping good" and I have never actually used it! In all the time that I have had this I have never seen another example - so dating from the late 1950s or 1960s - I would imagine it is very rare. The dish would have been used at cocktail parties - or brought out at Christmas and each little dish would have been filled with peanuts, Ritz crackers, olives, cocktail cherries, pickles etc. perhaps with a little dip in the centre circular dish. 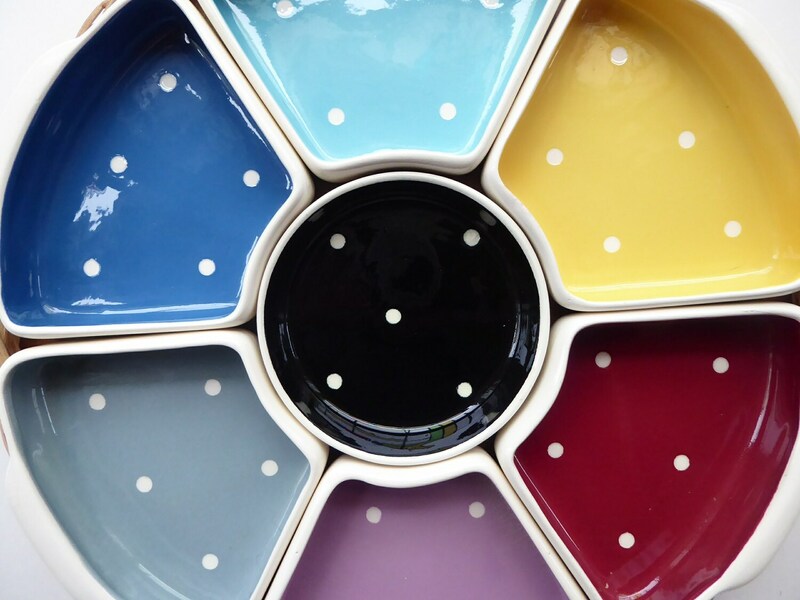 There are six harlequin coloured dishes all around - all with tiny white polka dots as deocation. 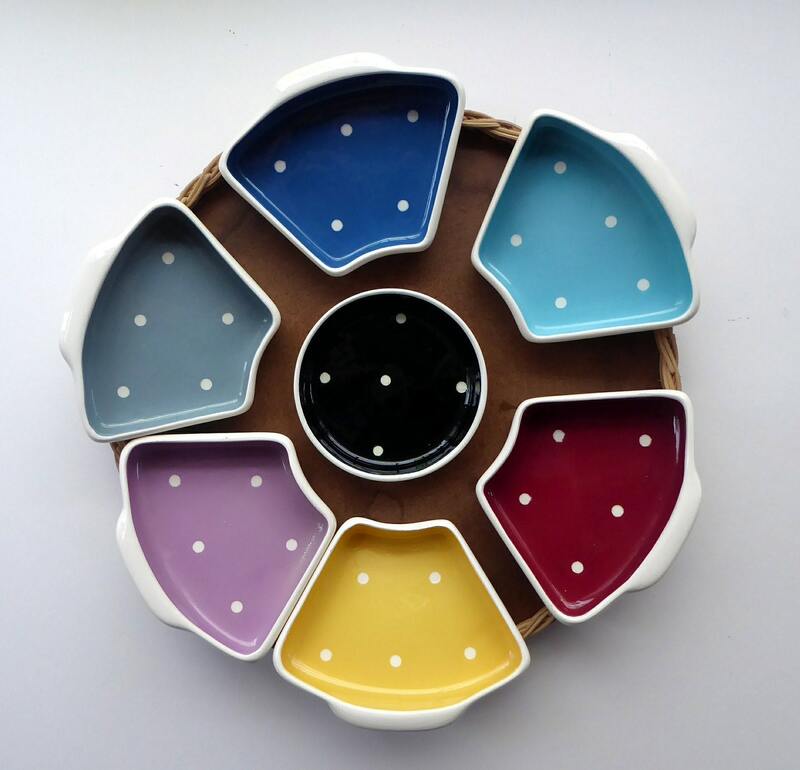 The central dish is black with polka dots. 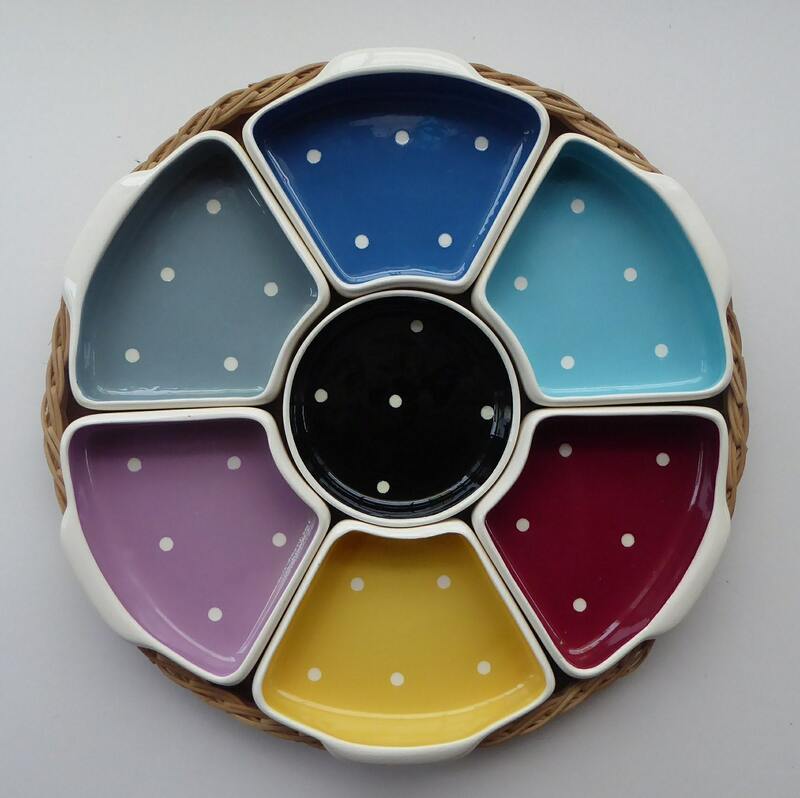 All the dishes fit flushly into its original fitted tray - which is not a serving tray but more of a base tray for the dishes - the tray has a hardboard base with a wicker edging to that the dishes are held nice and tightly in place and dont tip out if they are moved about. I love this; not sure why after all this time I have decided to sell... but there you go. The tray has an overall diameter of 12 3/4 inches. 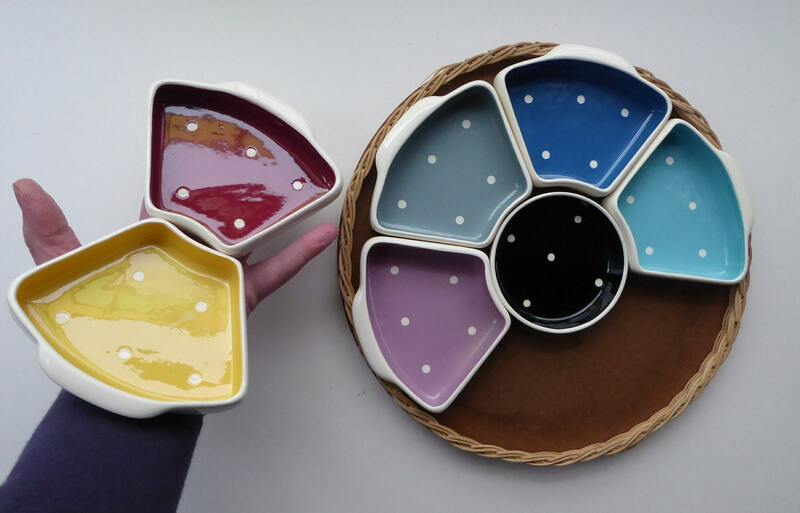 Each of the six dishes measures 5 1/2 inches x 4 inches. The central dish has a diameter of 4 inches - and all of them are about an inch in height. All of the dishes have no chips or staining - there is a little issue with the back of the yellow dish which seems to have a fine hairline - not all the way thorough - more of a scratch to the glaze but visible - if you tap this dish it still rings - so a minor flaw to the dish - but not a major issue - it is on the base. It is quite heavy - coming in at 1.3 kg, and this would probably limit posting to the UK only. 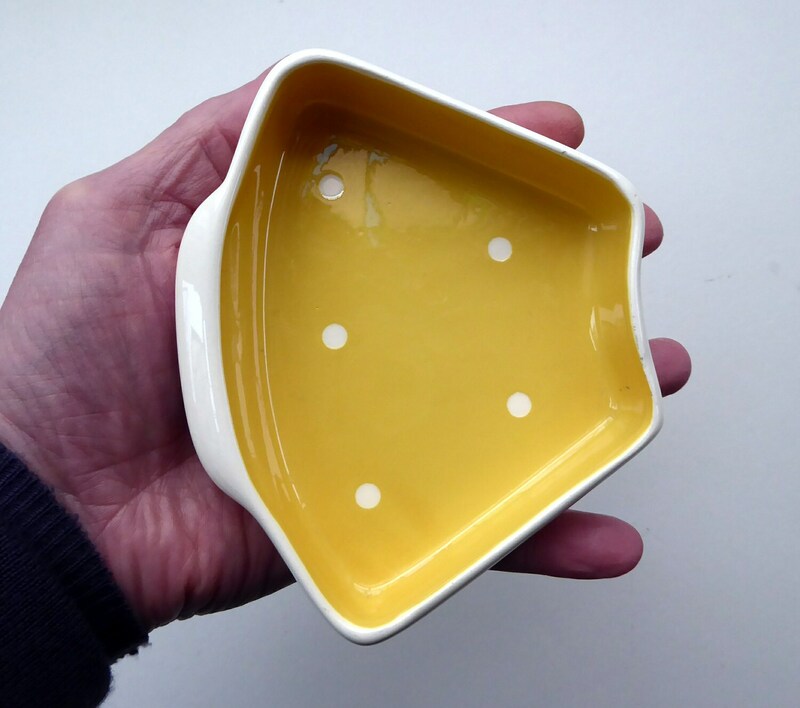 Certainly a fabulous piece of mid century ceramics - which would fabulous on a low Scandinavian coffee table... full of TV time nibbles.